There has been a lot of talk lately about an anti-establishment fervor in the Democratic Party, largely fueled by both dissatisfaction with the status quo and the manner in which the DNC rigged the rules to block challengers to Hillary Clinton in 2016. Clinton’s inability to beat a candidate as terrible as Donald Trump cast more doubt on the party establishment’s strategy of promoting moderate candidates. Alexandria Ocasio-Cortez’s victory over party insider Joseph Crowley in New York’s 14th congressional district Democratic primary gave additional hope for progressive and true liberal Democrats hoping to beat the party establishment. In Michigan efforts to beat establishment candidate Gretchen Whitmer (who would still be far preferable to GOP front runner Bill Schuette) for the nomination for Governor might be thwarted by two candidates running as progressives in Michigan who are likely to split the vote. However, only one is a true progressive. In Michigan, businessperson Shri Thanedar has spent millions of dollars on television ads casting himself as “the most progressive Democrat running for governor,” and promising that he would bring single-payer health care to Michigan. Over the last year, investigations by The Intercept have revealed many facts which cast doubt on Thanedar’s progressive branding. He donated thousands of dollars to Sen. John McCain’s presidential campaign, he was spotted clapping and nodding approvingly at a Marco Rubio presidential rally, and several Michigan political consultants have claimed that Thanedar once consulted them about possibly running as a Republican. But despite having a more well-developed plan, El-Sayed’s middle-class background means he does not have the same resources to advertise his health care plan as does Thanedar, who, not without controversy, made a fortune in the chemical testing industry. As a result, there’s a real risk that the public might be misled. 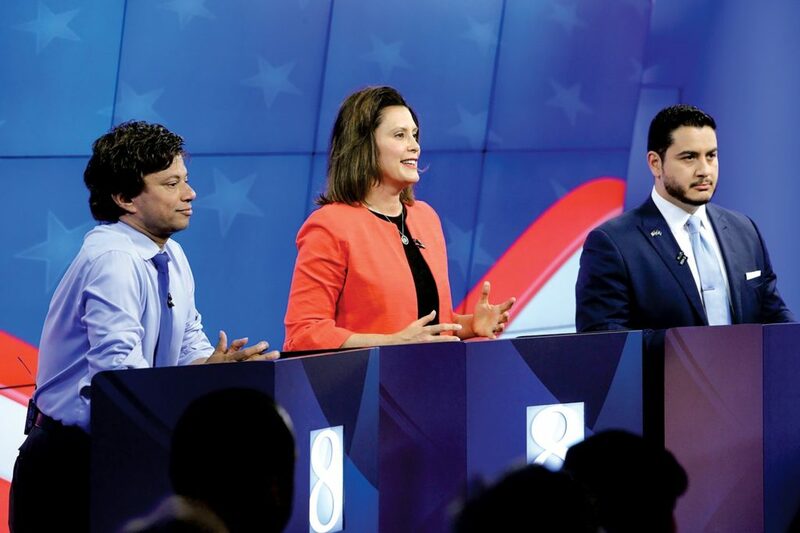 But by coopting a progressive message and splitting the progressive vote, Thanedar has helped Whitmer, an establishment candidate, take a comfortable lead. Whitmer is the daughter of former Blue Cross Blue Shield CEO Richard Whitmer. She’s the only Democratic candidate in the race who does not back single-payer, saying that it’s not “realistic” in Michigan at this time. BCBS Michigan lobbyists threw a fundraiser for Whitmer earlier this year. And she’s currently taking heat from an unidentified group who have paid for ads attacking her from accepting “big money” from insurance companies. El-Sayed has been endorsed by Justice Democrats, Our Revolution, The People for Bernie, Our Revolution, the Progressive Caucus of the Michigan Democratic Party, Democracy for America, and after her victory in New York, by Alexandria Ocasio-Cortez. Whitmer has a long list of establishment endorsements. I am not aware of any significant endorsements for Thanedar but the Grosse Pointe Democratic Club has issued an anti-endorsement for Thanedar warning Democrats NOT to vote for him. 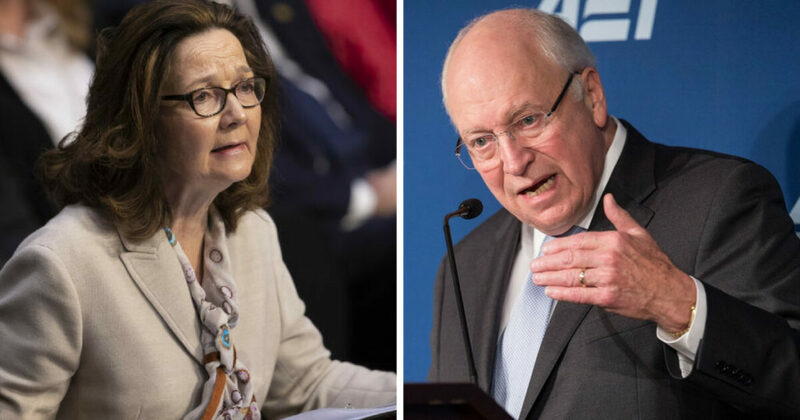 Haspel Evades Questions On Torture, Cheney Backs It, And Will Democrats Back Down On Resisting Once Again? The American Civil Liberties Union has outlined how Gina Haspel evaded multiple questions from the Senate Intelligence Committee this week. This included a question from Kamala Harris whether she found torture to be immoral. She evaded questions from Ron Wyden about whether she had wanted the use of torture “to be continued or expanded” between 2005 and 2007. She refused to recuse herself from decisions on declassifying her role in torture, with Haskel making the decisions regarding which documents the CIA will release. She misrepresented the content of torture tapes. She evaded questions on Trump’s views on torture. The vote on Haspel could be very close. So far one Democrat, Joe Manchin, said he would vote for her while John McCain has said he would vote against. Rand Paul previously stated he would oppose the confirmation of both Pompeo and Haspel, but folded on Pompeo. It is difficult to be optimistic, to put that mildly. The history of Democrats throughout the war on terror is to ensure that just enough members of their caucus join with the GOP majority to ensure passage of even the most extremist pieces of legislation or nominees justified in the name of terrorism or national security. The primary tactic in this game is Villain Rotation. They always have a handful of Democratic Senators announce that they will be the ones to deviate this time from the ostensible party position and impede success, but the designated Villain constantly shifts, so the Party itself can claim it supports these measures while an always-changing handful of their members invariably prevent it. One minute, it’s Jay Rockefeller as the Prime Villain leading the way in protecting Bush surveillance programs and demanding telecom immunity; the next minute, it’s Dianne Feinstein and Chuck Schumer joining hands and “breaking with their party” to ensure Michael Mukasey’s confirmation as Attorney General; then it’s Big Bad Joe Lieberman single-handedly blocking Medicare expansion; then it’s Blanche Lincoln and Jim Webb joining with Lindsey Graham to support the de-funding of civilian trials for Terrorists; and now that they can’t blame Lieberman or Ben Nelson any longer on health care (since they don’t need 60 votes), Jay Rockefeller voluntarily returns to the Villain Role, stepping up to put an end to the pretend-movement among Senate Democrats to enact the public option via reconciliation. We most recently saw the Democrats act more like collaborators than a resistance civil liberties during the votes on FISA renewal with eighteen Democrats siding with the Republicans to prevent consideration of amendments to reform the law. The eighteen Democrats provided exactly the number of votes for cloture to pass. The Democrats received an electoral gift in 2016 with an opponent as terrible as Donald Trump. They could have probably nominated a name taken at random from the phone book and beaten him. Instead the Democrats rigged their nomination for the one politician in American who was worse. Since losing the election, polls have repeatedly shown Clinton’s approval to be even lower than Trump’s atrociously low approval rating, and the streak continues. The latest Wall Street Journal/NBC News poll finds those with a positive view of Clinton at a new low of 27 percent, with Donald Trump at 35 percent. Right before the election, the share of people who viewed Hillary Clinton unfavorably was 10 points larger than those with a favorable view of her, according to the Wall Street Journal/NBC poll — a bigger gap than any other recent losing presidential candidate. Our latest poll is a reminder of just how unusual a figure Mrs. Clinton is in terms of her unpopularity. Historical WSJ/NBC polling shows that recent losing presidential candidates — Mitt Romney, John McCain, John Kerry and Al Gore — experienced post-election declines in positive sentiment. But Mrs. Clinton’s dropoff is a bit steeper–her positive rating is at a new low of 27%, compared with 52% who have a negative opinion. That spread of 25 percentage points is greater than President Trump’s, who is under water by 18 points. Her negative numbers make her something of a natural target for Republicans who want to associate their opponents with her as the party heads into a potentially difficult midterm election this fall. In doing so, they have managed to put some vulnerable Democrats in states Mr. Trump easily won, like Sens. Heidi Heitkamp of North Dakota and Claire McCaskill of Missouri, on the defensive. That was driven home last month when Democrats took distance from comments Mrs. Clinton, attending a conference in India, made about middle-American Trump voters. The question is how much of a factor she will really be in 2018. It’s important to keep in mind that “she’s not on the ballot,” Republican pollster Bill McInturff, who conducted part of the April poll, told me. He said that there are many “ticked off Democrats who might not like her, but given [Mr. Trump is] the incumbent … he’s the focus of most of their anger.” People in our poll who view both Mr. Trump and Mrs. Clinton negatively help illustrate this thinking. In 2016, these voters — those who we negative on both Mr. Trump and Mrs. Clinton — preferred a Republican Congress; now, they, like other voters, say they prefer a Democratic-controlled Congress. They are probably right that the key factor here is that Clinton is not on the ballot. Having Donald Trump in the White House will probably hurt Republicans far more this year than objections to Hilary Clinton. This poll should remind Democratic candidates of the need to keep Clinton away. “I was really struck by how people said that to me — you know, mostly people in the press, for whatever reason — mostly, ‘Go away, go away,’” Clinton said Thursday during an event at Rutgers University. “And I had one of the young people who works for me go back and do a bit of research. They never said that to any man who was not elected. I was kind of struck by that,” Clinton said. “I’m really glad that, you know, Al Gore didn’t stop talking about climate change,” Clinton said to applause. “And I’m really glad John Kerry went to the Senate and became an excellent secretary of State,” the former first lady continued. “And I’m really glad John McCain kept speaking out and standing up and saying what he had to say. And for heavens sakes, Mitt Romney is running for the Senate,” Clinton said. The 70-year-old ex-secretary of State has taken heat in recent weeks, even among some Democrats, for comments she made about Americans who voted for President Trump in the 2016 race. Of course this has nothing to do with gender. Al Gore, who had the most cause to complain about the election, avoided the public spotlight after he lost. Mitt Romney also limited political speech until he started to criticize Donald Trump. John Kerry and John McCain returned to the Senate where they did their jobs. 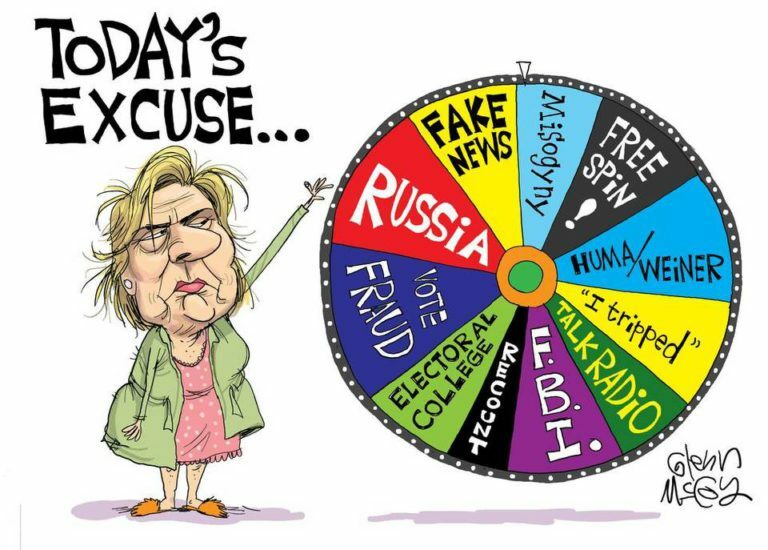 As was revealed in Shattered, Clinton decided to blame others such as Russia for the loss within twenty-four hours of losing. Her claims regarding Russia, which go far beyond the actual evidence, are harmful in many ways. It gives establishment Democrats an excuse to resist reform. It plays into the hands of neocons who desire regime change in Russia, with their claims about Russia being no more truthful than their claims about WMD in Iraq. It is used to justify restrictions on freedom of speech, and has led to McCarthyism from establishment Democrats who claim that criticism stems from support for Putin. Of course Hillary Clinton has the right to continue to speak publicly, but those of us who disagree with her also have the right to respond–regardless of how much her supporters attempt to suppress criticism of her. It is also understandable that professional politicians in her party, which saw serious losses in the presidential race and down ticket because of Clinton in 2016, do not want Clinton to bring about further losses for their party in 2018. Donald Trump has issued his fake news awards. Besides being seen as an attack on the First Amendment, it is rather absurd for Trump to be criticizing anyone for fake news (even in the cases where the media did get it wrong) considering the vast amount of misinformation put out in his speeches and tweets. This is, after all, the administration, which from the start was plagued by alternative facts. Trump’s first choice was a rather strange one: “The New York Times’ Paul Krugman claimed on the day of President Trump’s historic, landslide victory that the economy would never recover.” Yes, Trump is right in saying that the Dow has hit a record high, but the credit for much of the economic growth in the past year is due to inheriting a healthy economy. Regardless, even if Paul Krugman was wrong in a prediction in an opinion piece, this is not the same as the media getting the facts wrong in news reporting. Krugman even retracted his own prediction three days later, saying that the problems he predicted would not be immediate. To be fair to Trump, he is correct about some of the other items he listed. As I (and others) have pointed out, the media has made huge mistakes in its coverage of Russia, and has retracted multiple false reports. Fairness And Accuracy in Reporting has criticized the Russia hysteria at MSNBC more than once (although CNN received the brunt of Trump’s attacks). I suspect that many journalists who predicted that Clinton would win easily fell for the Russian conspiracy theories spread by Clinton and the DNC, blaming Russia for the loss to rationalize their own erroneous predictions. There were also errors by the media on other matters, including some which were quickly retracted. How many of Trump’s errors have been retracted? Vox went through the awards and pointed out where the media made mistakes in the Russia coverage and elsewhere. The more serious problem is the attack on the press and First Amendment rights. As I noted in December, the number of journalists in prison around the world is at a historical high. The Committee To Protect Journalists has attributed the increase to Donald Trump’s attacks on the free press. It was a year in which a daily assault on the constitutionally protected free speech was launched by the same White House, an assault that is as unprecedented as it is unwarranted. The enemy of the people was how the president of the United States called the free press in 2017. Mr. President, it is a testament to the condition of our democracy that our own president uses words infamously spoken by Joseph Stalin to describe his enemies. It bears noting that so fraught with malice was the phrase “enemy of the people,” that even [Soviet leader] Nikita Khrushchev forbade its use, telling the Soviet Communist Party the phrase had been introduced by Stalin for the purpose of “annihilating such individuals” who disagreed with the supreme leader. This alone should be the source of great shame for us in this body. Especially for those of us in the president’s party. For they are shameful, repulsive statements and of course the president has it precisely backward. 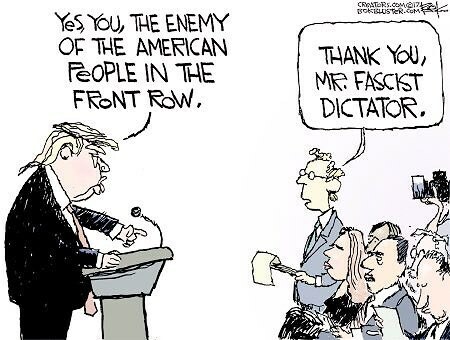 Despotism is the enemy of the people. The free press is the despot’s enemy, which makes the free press the guardian of democracy. When a figure in power reflexively calls any press that doesn’t suit him fake news, it is that person who should be the figure of suspicion, not the press. I dare say that anyone who has had the privilege and awesome responsibility to serve in this chamber knows that these reflexive slurs of “fake news” are dubious at best. Those of us who travel overseas, especially to war zones and other troubled areas all around the globe encounter members of US-based media who risk their lives and sometimes lose their lives reporting on the truth. To dismiss their work as fake news is an affront to their commitment and their sacrifice. …While administration officials often condemn violence against reporters abroad, Trump continues his unrelenting attacks on the integrity of American journalists and news outlets. This has provided cover for repressive regimes to follow suit. The phrase “fake news” — granted legitimacy by an American president — is being used by autocrats to silence reporters, undermine political opponents, stave off media scrutiny and mislead citizens. CPJ documented 21 cases in 2017 in which journalists were jailed on “fake news” charges. Trump’s attempts to undermine the free press also make it more difficult to hold repressive governments accountable. For decades, dissidents and human rights advocates have relied on independent investigations into government corruption to further their fight for freedom. But constant cries of “fake news” undercut this type of reporting and strip activists of one of their most powerful tools of dissent. Ultimately, freedom of information is critical for a democracy to succeed. We become better, stronger and more effective societies by having an informed and engaged public that pushes policymakers to best represent not only our interests but also our values. Journalists play a major role in the promotion and protection of democracy and our unalienable rights, and they must be able to do their jobs freely. Only truth and transparency can guarantee freedom. In an explosive new memoir, Brazile details widespread dysfunction and dissension throughout the Democratic Party, including secret deliberations over using her powers as interim DNC chair to initiate the process of removing Clinton and running mate Sen. Tim Kaine (Va.) from the ticket after Clinton’s Sept. 11, 2016, collapse in New York City. There were many reasons to consider taking Clinton off the ticket, but her isolated fainting spell was among the more trivial. On the other hand, Brazile’s assessment of her campaign as being badly mismanaged is consistent with other reports. Brazile’s intended replacement ticket of Biden and Booker would have been a much stronger ticket than Clinton/Kaine and probably could have beaten Donald Trump if they had won the nomination through the primary system. It is hard to say what would have happened if the replacement was made at the last minute. Sanders supporters would have questioned why the runner up in the nomination battle was not made the replacement, especially in light of how the party rigged the nomination for Clinton. They would probably have had even more difficulty keeping the votes of Clinton voters considering how twenty-five percent of Clinton supporters voted for McCain/Palin after Clinton lost the 2008 nomination to Barack Obama. 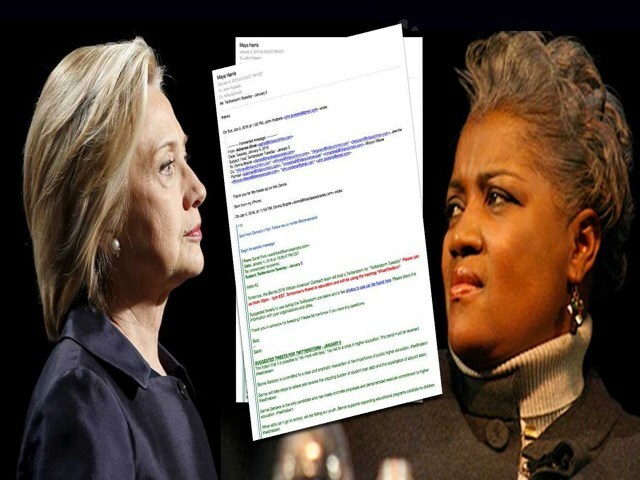 While there was plenty of previous evidence of the party violating its bylaws and rigging the nomination for Clinton, Donna Brazile’s confession of this in another excerpt from her book has again raised the issue. As expected, Clinton supporters have been trying to twist the facts again. They ignore the fact that there was already significant evidence that the party was violating its rules for remaining neutral. They claim that the agreement only affected the general election despite it beginning in 2015 and going through the primary season including multiple matters affecting the primary battle. They claim that Bernie Sanders had a similar agreement when the fund raising agreement offered Sanders was substantially different. They ignore how Clinton used this to starve down ticket candidates of money in a scheme which appears like money laundering and evasion of campaign finance laws. The bottom line in 2016 was that Clinton was a terrible candidate who could not win a national election fairly. Hillary Clinton could not beat an unknown like Barack Obama in 2008. She could not beat someone as atrocious as Donald Trump in 2016. She could not beat an unlikely challenger like Bernie Sanders in 2016 without massive intervention by the party to rig the nomination for her. The consequence of the DNC rigging the nomination for a candidate who could not win the nomination on her own was having a weak candidate who could not even beat Donald Trump. Update: Glenn Greenwald has subsequently posted, also debunking some of the false claims from Clinton supporters I mentioned above, along with some bogus attacks being made regarding Donna Brazile and the DNC email. A week ago we were faced with predictions both that the Republicans might be able to repeal the Affordable Care Act with their new plan and that the world was going to come to an end. Today it is looking like neither will occur. It does not look like the Republicans have the votes to pass Graham-Cassidy. Rand Paul quickly announced he will vote against it because it does not go far enough in taking away everyone’s health care coverage. Hopefully he remains as forceful in standing up to Donald Trump on issues where he has more sensible positions such as non-interventionism and civil liberties. The real killer was when John McCain announced he would vote against this bill for the same reasons he voted against the previous Republican attempt to repeal Obamacare While his opposition is appreciated, before he is made out to be too much of a hero we must not forget that in 2008 he ran on a terrible health care plan which would have led to millions who had health care even before Obamacare losing their coverage. Graham-Cassidy would lead to such terrible outcomes that other Republicans also remain undecided, making it very unlikely to pass. It becomes more difficult for Republicans to repeal Obamacare after the end of September, leading to pressure from conservative donors to make one more attempt. For Donald Trump, this isn’t about the Graham-Cassidy bill. It’s about Obamacare, which he hates, because Obama’s name is on it. He likes to have his name on things: buildings, vodka, you name it. At this point he would sign anything if it meant getting rid of Obamacare. He’d sign copies of the Quran at the Barnes and Noble in Fallujah if it meant he could get rid of Obamacare…I guarantee he doesn’t know anything about this Graham-Cassidy bill. He doesn’t know the difference between Medicare and Medicaid; he barely knows the difference between Melania and Ivanka. David Meade, who claimed the world is ending Saturday when a mysterious planet collides with Earth, is now backtracking on the calamitous claim. 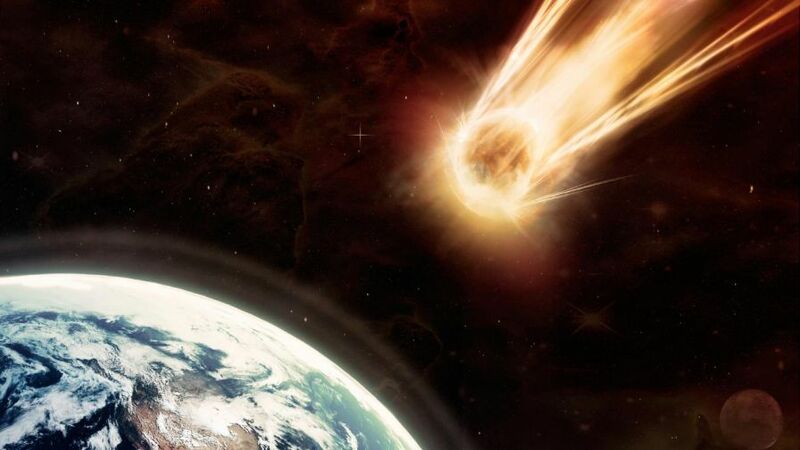 Meade said the world won’t end on Sept. 23 after all, but instead Saturday will only mark the beginning of a series of catastrophic events to occur over several weeks. Meade said his prediction is based on verses and numerical codes found in the Bible, specifically in the apocalyptic Book of Revelation. He said recent events, such as the solar eclipse and Hurricanes Irma and Harvey, are omens of the approaching apocalypse. The significant number is 33, according to Meade. Others made similar predictions about the beginning of a series of catastrophic events before November 8 and January 20, saying the significant number is 45. This is just one of several truthful verrits I have posted on Facebook, responding to their distortions of polling data on Sanders voters who voted for Trump. (These were actually Republicans who Sanders was able to get to vote Democratic in the primaries but went home to the Republican Party when Clinton got the nomination.) I’ll post more of my hacked verrits on the blog in the future. Hillary Clinton and her supporters have the irrational view that it makes sense to blame those who did not vote for her for her loss, failing to understand that this is how politics works. Any candidate can claim they would have won if enough people who did not vote for them had decided to vote for them, and it is the fault of the Democrats if they ran a candidate so terrible that she could not even beat Donald Trump. 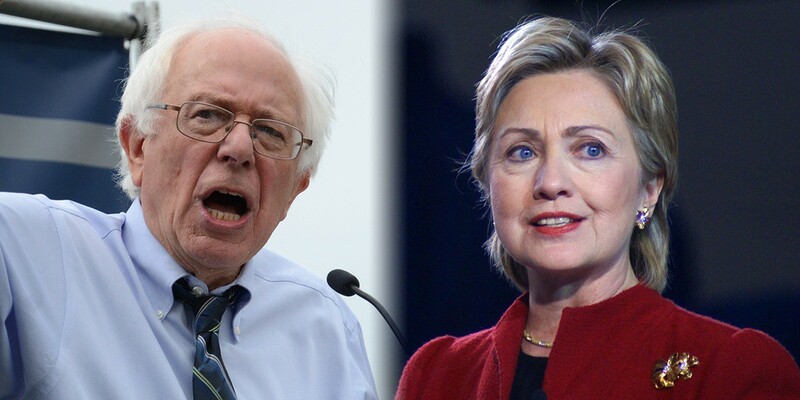 Clinton supporters are now twisting recently released polling data to blame supporters of Bernie Sanders for Clinton’s inability to beat Trump. The article further states, “the most important feature of Sanders-Trump voters is this: They weren’t really Democrats to begin with.” In other words, Bernie Sanders brought in non-Democratic voters, while Hillary Clinton could not win the support of these voters. This is a difference between Sanders and Clinton which we were well aware of during the primaries. Another useful comparison is to 2008, when the question was whether Clinton supporters would vote for Barack Obama or John McCain (R-Ariz.) Based on data from the 2008 Cooperative Campaign Analysis Project, a YouGov survey that also interviewed respondents multiple times during the campaign, 24 percent of people who supported Clinton in the primary as of March 2008 then reported voting for McCain in the general election. Thus, the 6 percent or 12 percent of Sanders supporters who may have supported Trump does not look especially large in comparison with these other examples. This certainly blows up the arguments of Clinton supporters based upon some expectation of party loyalty with more Clinton supporters than Sanders supporters going over to the Republicans. I am actually not surprised by this. After all, Hillary Clinton’s views are far more in line with the Republicans than liberal/progressive Democrats. Many backed her based upon gender without any serious understanding of her views. Therefore a Republican ticket like McCain/Palin wouldn’t be very far from Clinton ideologically, and would allow them to vote for a female candidate. Core Sanders supporters are far more progressive than Clinton and those voting for a non-Democrat might consider candidates such as Jill Stein, but did not have a major party candidate who was similar to them ideologically as Clinton supporters did. This left a smaller number who would vote Republican in 2016. On the other hand, the left/right political spectrum does not explain the choices of all voters. Again, this data shows that there were voters who Bernie Bernie Sanders could win away from the Republicans, but Hillary Clinton could not. This was one of the reasons Sanders would have made a better general election candidate. The data in this poll alone does not prove that Sanders would have beaten Trump, but other data available does suggest this. Sanders typically polled about ten points better than Clinton in head to head polls against Republicans. Sanders did better in the rust belt states which cost Clinton the election in the electoral college. Sanders was not involved in scandals as Clinton was, and there were no emails which showed matters comparable to what was released about Clinton by Wikileaks. It makes no sense for Clinton supporters to blame James Comey, Wikileaks, and Russia for Clinton losing, but deny that not being affected by these matters would make Sanders a stronger general election candidate. In an election this close, virtually any difference might have changed the election result–including perhaps Clinton not making the many mistakes she made throughout the campaign. If all the Sanders voters who voted for Trump had voted for Clinton she theoretically could have won. On the other hand, there were even more people who voted for Obama in the previous election but voted for Trump. As with the vast majority of election analyses I have read, they did not even look at the degree to which being a neoconservative war monger might have affected the actions of voters, with one study earlier this summer suggesting that it was her support for endless war which cost her the election. Despite his many faults, Trump did outflank Clinton on the left on both trade and foreign policy (although Trump was far too incoherent on foreign policy for many of us to consider backing him based upon this, even if we could have overlooked his racism and xenophobia). The key factor in any analysis is not that something different might have allowed Clinton to win, but that running against a candidate as terrible as Donald Trump, Clinton was so close that these factors allowed her to lose. If Clinton was running ten points better against Trump (as Sanders had), then Russia, James Comey, and even the loss of some votes to Trump would not have cost her the election. Barack Obama was able to win despite losing far more Clinton voters to Republicans because he was a stronger candidate to begin with. Donald Trump is president because the Democrats picked a horrible candidate who then went on to run a terrible campaign. No amount of spinning poll results will change this.